My Second Life as Amariah Francis: MODA Winter Showcase Today Saturday Featuring *OC* an Leezu! 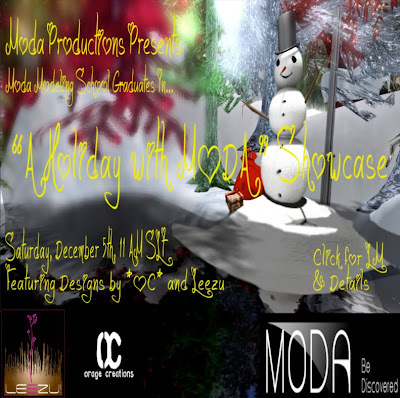 MODA Winter Showcase Today Saturday Featuring *OC* an Leezu! Our newest graduates from MODA Modeling School will be putting on an awesome showcase featuring clothing from Leezu and *OC*! This is going to be one of the hottest shows in December and we don't want you to miss it. Best of all, it's being DJ'ed and announced by DJ/Model Harlee Lane! The show begins at 11AM SLT, on Saturday December 5th, 2009. We would love to have you here to celebrate our new graduates and great fashion.